Weights for all the items listed on Goods and Services are their filled weights (except where otherwise designated). Adventurers face all sorts of challenges and difficulties, and the right gear can make the difference between a successful adventure and failure. Most of this gear is basic equipment that might come in handy regardless of your skills or class. For objects with hardness and hit points, see Strike an Object. Aspergillum: This lightweight metal device looks like a small club or a light mace. Each contains a reservoir that can hold up to 3 pints (three flasks) of holy water. By shaking the aspergillum as a standard action, you can sprinkle one flask of holy water on a target within melee reach. This action is a ranged touch attack (which does not provoke an attack of opportunity). An aspergillum does not require any proficiency to use. Many adventurers prefer using an aspergillum to dispense holy water rather than throwing or pouring out the contents of a flask. Backpack: A leather pack carried on the back, typically with straps to secure it. Bandoleer: This leather belt has loops or pouches for carrying small items (up to dagger size). It is usually worn across the chest. It holds eight items. Bandoleer, Masterwork: This well-crafted bandoleer holds twelve items. Bedroll: Adventurers never know where they're going to sleep, and bedrolls help them get better sleep in haylofts or on the cold ground. A bedroll is bedding and a blanket thin enough ro be rolled up and tied. In an emergency, it can double as a stretcher. Blanket, Winter: A thick, quilted, wool blanket. Caltrops: Caltrops resemble large metal jacks with sharpened points rather than balls on the ends of their arms. They are essentially iron spikes designed so that one point is always facing up. You scatter them on the ground in the hope that your enemies step on them or are at least forced to slow down to avoid them. One bag of caltrops (the 2-pound unit listed on Goods and Services) covers an area 5 feet square. Each time a creature moves into an area covered by caltrops (or spends a round fighting while standing in such an area), the creature may step on one. The caltrops make an attack roll (base attack bonus +0) against the creature. For this attack, the creature's shield, armor, and deflection bonus do nor count. (Deflection averts blows as they approach you, but it does not prevent you from touching something dangerous.) If the creature is wearing shoes or other footwear, it gets a +2 armor bonus to AC. If the caltrops succeed at the attack, the creature has stepped on one. The caltrop deals 1 point of damage, and the creature's speed is reduced by one-half because its foot is wounded. This movement penalty lasts for 1 day, until the creature is successfully treated with the Heal skill (DC 15), or until it receives at least 1 point of magical curing. A charging or running creature must immediately stop if it steps on a caltrop. Any creature moving at half speed or slower can pick its way through a bed of caltrops with no trouble. Candle: A candle clearly illuminates a 5-foot radius and burns for 1 hour. Case, Map or Scroll: A capped leather or tin tube for holding rolled pieces of parchment or paper. Chain: Chain has a hardness of 10 and 5 hit points. It can be burst with a Strength check (DC 26). Crowbar: An iron bar for levering things open. Flask: A ceramic, glass, or metal container fitted with a tight stopper. It holds 1 pint of liquid. Flint and Steel: Striking the steel and flint together creates sparks. By knocking sparks into tinder, you can create a small flame. Lighting a torch with flint and steel is a full-round action, and lighting any other fire with them takes at least that long. Games: Some games of skill are detailed below, but games of chance are also popular. Wagering on any sort of game is also a favorite pastime. Chess: Faerûnian chess game pieces include kings, queens, priests (bishops), knights-errant (knights), rooks (castles), and pawns. Sets often use famous figures, such as rulers or deities, as kings. A set consists of thirty-two pieces and a board in a wooden case. A fine set has ebony and ivory pieces and a marble board. A common set is made from more humble materials, such as carved and dyed wood. Draughts: Draughts is similar to the modern game of checkers. A set consists of twenty-four clay or stone pieces and a board of alternating light and dark squares in a wooden case. The board is the same as a chessboard in pattern. Old Men's Bones: This game is similar to the modern game of pick-up sticks. The object is to remove the bones from the pile you have dumped them into one at a time without toppling the pile. The set has "sticks" made from bones (usually those of a fowl) and a leather or metal canister for carrying them. Talis Deck: A deck of seventy-eight cards, typically made of lacquered paper or parchment, in a wooden case. The deck is similar to a tarot deck. Grappling Hook: Tied to the end of a rope, the hook can secure the rope to battlements, windows, tree limbs, and so forth. Hammer: A one-handed hammer with an iron head that is useful for pounding pitons into a wall. Hammock: An innovation from the land of Maztica, a hammock is a hemp or linen blanket with sturdy cords woven into it so that it cap be strung up between two trees or other vertical supports. Inkpen: A wooden stick with a special tip on the end. The tip draws ink in when dipped in a vial and leaves an ink trail when drawn across a surface. Insect Netting: These sheets of fine mesh are made of silk from Kara-Tur. When draped around a sleeper in a bedroll or hammock, insect netting keeps away normal insects (Fine vermin, but not magical effects that employ such creatures such as insect plague or creeping doom). Jug, Clay: A basic ceramic jug fitted with a stopper. It holds 1 gallon of liquid. Ladder, 10-foot: A straight, simple wooden ladder. Lamp, Common: A lamp clearly illuminates things in a 15-foot radius and burns for 6 hours on a pint of oil. It burns with a more even flame than a torch, but, unlike a lantern, is uses an open flame and it can spill easily, making it too dangerous for most adventuring. You can carry a lamp in one hand. Lantern, Bullseye: A bullseye lantern has only a single shutter, with its other sides being highly polished inside to reflect the light in a single direction. It illuminates a cone 60 feet long and 20 feet wide at the end, and is burns for 6 hours on a pint of oil. You can carry a lantern in one hand. Lantern, Hooded: A hooded lantern is a standard lantern with shuttered or hinged sides. You can carry a lantern in one hand. Is clearly illuminates a 30-foot radius and burns for 6 hours on a pint of oil. Lock: A lock is worked with a large, bulky key. The DC to open this kind of lock with the Open Locks skill depends on the lock's quality: very simple (DC 20), average (DC 25), good (DC 30), amazingly good (DC 40). Manacles and Manacles, Masterwork: These manacles can bind a Medium-size creature. The manacled character can use the Escape Artist skill to slip free (DC 30, or DC 35 for masterwork manacles). To break the manacles requires success at a Strength check (DC 26, or DC 28 for masterwork manacles). Manacles have a hardness of 10 and 10 hit points. Most manacles have locks; add the cost of the lock you want to the cost of the manacles. For the same price, one can buy manacles for Small creatures. For Large creatures, manacles cost ten times this amount, and for huge creatures, one hundred times this amount. Gargantuan, Colossal, Tiny, Diminutive, and Fine creatures can only be held by specially made manacles. Marbles: About two dozen assorted glass, flawed rock crystal, or clay spheres in a leather pouch. Commonly used as a toy, but also useful for checking the slope in a dungeon corridor (just set one down and see which way it rolls), or as a non-damaging alternative to caltrops. One bag covers an area 5 feet square. Creatures moving through or fighting in the area must make Balance checks (DC 15) or be unable to move for 1 round (or they may fall; see the Balance skill description). Mirror, Small Steel: A polished steel minor is handy when you want to look around corners, signal friends with reflected sunlight, keep an eye on a medusa, make sure that you look good enough to present yourself to the queen, or examine wounds that you've received on hard-to-see parts of your body. Oil: A pint of oil burns for 6 hours in a lantern. You can use a flask of oil as a grenadelike weapon (see Grenadelike Weapons, and Grenadelike Weapon Attacks). Use the rules for alchemist's fire, except that is takes a full-round action to prepare a flask with a fuse. Once it is thrown, there is only a 50% chance that the flask ignites successfully. You can pour a pint of oil on the ground to cover an area 5 feet square (provided the surface is smooth). If lit, the oil burns for 2 rounds and deals 1d3 points of damage to each creature in the area. Paper: A white sheet of paper made from cloth fibers. Parchment: Goat hide or sheepskin prepared for writing on. Potion Belt: This sturdy leather belt similar to a bandoleer has pockets shaped to hold potion vials and is fitted with ties or flaps to keep the potions from falling out. It holds six potions. Retrieving a potion from a potion belt is a free action once per round. Potion Belt, Masterwork: This extremely well-made potion belt holds ten potions. Retrieving a potion from a potion belt is a free action once per round. Piton: When a wall doesn't offer you handholds and footholds, you can make your own. A piton is a steel spike with an eye through which you can loop a rope. (See the Climb skill). Pole, 10-foot: When you suspect a trap, you'd rather put the end of your 10-foot pole through a hole in a wall than your hand. Pouch, Belt: This leather pouch straps to your belt. It's good for holding things that you may need in a hurry, such as potions. Ram, Portable: This iron-shod wooden beam is the perfect tool for battering down doors. Not only does it give you a +2 circumstance bonus on your Strength check to break open a door, but it allows a second person to help you without having to roll, adding another +2 to your check (see Breaking Open Doors). Rations, Trail: Trail rations are compact, dry, high-energy foods suitable for travel, such as jerky, dried fruit, hardtack, and nuts. Rope, Hemp: This rope has 2 hit points and can be burst with a successful Strength check (DC 23). Rope, Silk: This rope has 4 hit points and can be burst with a successful Strength check (DC 24). It is so supple that is adds a +2 circumstance bonus to Use Rope checks. Sack: A drawstring sack made of burlap or a similar material. Scroll Organizer: This long strip of leather has an overlapping series of fifteen pockets sewn along one side, each large enough to hold a scroll of a single spell. When slipped into a pocket, only the top of a scroll shows, allowing you to scan the scrolls' titles. Signet Ring: Your signet ring has a unique design carved into it. When you press this ring into warm sealing wax, you leave an identifying mark. Sledge: A two-handed, iron-headed hammer that is good for smashing open treasure chests. Tent: This simple tent sleeps two. Torch: A wooden rod capped with twisted flax soaked in tallow or a similar item. A torch clearly illuminates a 20-foot radius and burns for 1 hour. Vial: A ceramic, glass, or metal vial fitted with a tight stopper. The stoppered container usually is no more than 1 inch wide and 3 inches high. It holds 1 ounce of liquid. Waterskin: A leather pouch with a narrow neck that is used for holding water. Characters need a way to see in the dark, dangerous places where they often find adventures. Dwarves and half-orcs have darkvision, but everyone else needs light to see by. Typically, adventurers bring along torches or lanterns, and spellcasters have spells that can create light. See Light Sources for the radius that a light source illuminates and how long it lasts. Characters with low-light vision (elves, gnomes, and half-elves) can see objects twice as far away as the given radius. Characters with darkvision (dwarves and half-orcs) can see lit areas normally as well as dark areas within 60 feet. Candle 5 ft. 1 hr. Dancing lights (torches) 20 ft. (each) 1 min. Daylight 60 ft. 30 min. Light 20 ft. 10 min. *cone 60 feet long and 20 feet wide at the far end. Alchemist's Lab: This includes beakers, bottles, mixing and measuring equipment and a miscellany of chemicals and substances. This is the perfect tool for the job and so adds a +2 circumstance bonus to Craft (Alchemy) checks, but it has no bearing on the costs related to the Craft (Alchemy) skill (see the Craft (Alchemy) skill). Without this lab, a character with the Craft (Alchemy) skill is assumed to have enough tools to use the skill but not enough to get the +2 bonus that the lab provides. Artisan's Tools: This is the set of special tools needed for any craft. Without these tools, you have to use improvised tools (-2 penalty on your Craft check) if you can do the job at all. Artisan's Tools, Masterwork: As artisan's tools, but these are the perfect tools for the job, so you get a +2 circumstance bonus on your Craft check. Climber's Kit: Special pitons, boot tips, gloves, and a harness that aids in all sorts of climbing. This is the perfect tool for climbing and gives you a +2 circumstance bonus to Climb checks. Disguise Kit: A bag containing cosmetics, hair dye, and small physical props. This is the perfect tool for disguise and adds a +2 circumstance bonus to Disguise checks. It's exhausted after ten uses. Healer's Kit: This kit is full of herbs, salves, bandages and other useful materials. It is the perfect tool for anyone attempting a Heal check. Is adds a +2 circumstance bonus to the check. It's exhausted after ten uses. Holly and Mistletoe: Sprigs of holly and mistletoe are used by druids as the default divine focus for druid spells. Holly and mistletoe plants are easily found in wooded areas by druids, and sprigs from them are harvested essentially for free. Holy Symbol, Silver or Wooden: A holy symbol focuses positive energy. Clerics use them as the focuses for their spells and as tools for turning undead. Each religion has its own holy symbol, and a sun symbol is the default holy symbol for clerics not associated with any particular religion. A silver holy symbol works no better than a wooden one, but is serves as a mark of status for the wielder. Unholy Symbols: An unholy symbol is like a holy symbol except that is focuses negative energy and is used by evil clerics (or by neutral clerics who want to cast evil spells or command undead). A skull is the default unholy symbol for clerics not associated with any particular religion. Magnifying Glass: This simple lens allows a closer look at small objects. It is useful as a substitute for flint, steel, and tinder when starting fires (though it takes light as bright as direct sunlight to focus, tinder to light, and as least a full-round action to light a fire with a magnifying glass). It grants you a +2 circumstance bonus on Appraise checks involving any item that is small or highly detailed, such as a gem. Musical Instrument, Common or Masterwork: Popular instruments include fifes, recorders, lures, mandolins, and shalms. A masterwork instrument is of superior make. Is adds a +2 circumstance bonus to Perform checks and serves as a mark of status. Scale, Merchant's: This scale includes a small balance and pans and a suitable assortment of weights. A scale grants you a +2 circumstance bonus to Appraise checks involving items that are valued by weight, including anything made of precious metals. Spell Component Pouch: A small, watertight leather belt pouch with many small compartments. A spellcaster with a spell component pouch is assumed to have all the material components and focuses she needs except those that have a listed cost, divine focuses, or focuses that wouldn't fit in a pouch (such as the natural pool that a druid needs to look into to cast scrying). Spellbook, Wizard's (Blank): A large, leatherbound book that serves as a wizard's reference. A spellbook has 100 pages of parchment, and each spell takes up two pages per level (one page for 0-level spells). See Arcane Spells. Spelunker's Kit: This kit consists of a headlamp, head protection, protective clothing (including gloves and kneepads), and heavy boots that aid in all sorts of spelunking. A spelunking kit grants the user a +2 circumstance bonus on Balance, Climb, Escape Artist, and Survival checks made to navigate tough-to-access areas (see Spelunking). Thieves' Tools: These are the tools you need to use the Disable Device and Open lock skills. The kit includes one or more skeleton keys, long metal picks and pries, a long-nosed clamp, a small hand saw, and a small wedge and hammer. Without these tools, you have to improvise tools, and you suffer a -2 circumstance penalty on your Disable Device and Open locks checks. Thieves' Tools, Masterwork: This kit contains extra tools and tools of better make, granting you a +2 circumstance bonus on Disable Device and Open lock checks. Water Clock: This large, bulky contrivance gives the time accurate to within half an hour per day since it was last set. It requires a source of water, and it must be kept still because it marks time by the regulated flow of droplets of water. It is primarily an amusement for the wealthy and a tool for the student of arcane lore. Most people have no way to tell exact time, and there's little point in knowing that it is 2:30 P.M. if nobody else does. Different characters may want different outfits for various occasions. A beginning character is assumed to have an artisan's, entertainer's, explorer's, monk's, peasant's, scholar's, or traveler's outfit. This first outfit is free of cost and does not count against the amount of weight a character can carry. Artisan's Outfit: A shirt with buttons, a skirt or pants with a drawstring, shoes, and perhaps a cap or hat. This outfit may include a belt or a leather or cloth apron for carrying tools. Cleric's Vestments: Ecclesiastical clothes for performing priestly functions, not for adventuring. Cold Weather Outfit: A wool coat, linen shirt, wool cap, heavy cloak, thick pants or skirt, and boots. When wearing a cold weather outfit, add a +5 circumstance bonus to Fortitude saving throws against exposure to cold weather (see information on cold dangers). Courtier's Outfit: Fancy, tailored clothes in whatever fashion happens to be the current style in the courts of the nobles. Anyone trying to influence nobles or courtiers while wearing street dress will have a hard time of it. Without jewelry (costing perhaps an additional 50 gp), you look like an out-of-place commoner. Entertainer's Outfit: A set of flashy, perhaps even gaudy, clothes for entertaining. While the outfit looks whimsical, its practical design lets you tumble, dance, walk a tightrope, or just run (if the audience turns ugly). Explorer's Outfit: This is a full set of clothes for someone who never knows what to expect. Is includes sturdy boots, leather breeches or a skirt, a belt, a shirt (perhaps with a vest or jacket), gloves, and a cloak. Rather than a leather skirt, a leather overtunic may be worn instead over a cloth skirt. The clothes have plenty of pockets (especially the cloak). The outfit also includes any extra items you might need, such as a scarf or a wide-brimmed hat. Monk's Outfit: This simple outfit includes sandals, loose breeches, and a loose shirt, and is all bound together with sashes. Though it looks casual, the outfit is designed to give you maximum mobility, and it's made of high-quality fabric. You can hide small weapons in pockets hidden in the folds, and the sashes are strong enough to serve as short ropes. Depending on your style, the outfit may be decorated with designs that indicate your lineage or philosophical outlook. Noble's Outfit: This set of clothes is designed specifically to be expensive and to show it. Precious metals and gems are worked into the clothing. To fit into the noble crowd, every would-be noble also needs a signet ring (see Adventuring Gear above) and jewelry (worth as least 100 gp, or as least appearing to be worth that much). And it would be advisable to not show up to a ball in the same noble's outfit twice. Peasant's Outfit: A loose shirt and baggy breeches, or a loose shirt and skirt or overdress. Cloth wrappings are used for shoes. Royal Outfit: This is just the clothes, not the royal scepter, crown, ring, and other accouterments. Royal clothes are ostentatious, with gems, gold, silk, and fur in abundance. Scholar's Outfit: A robe, a belt, a cap, soft shoes, and possibly a cloak. Traveler's Outfit: Boots, a wool skirt or breeches, a sturdy belt, a shirt (perhaps with a vest or jacket), and an ample cloak with a hood. Inn: Poor accommodations at an inn amount to a place on the floor near the hearth, plus the use of a blanket if the innkeeper likes you and you're nor worried about fleas. Common accommodations are a place on a raised, heated floor, the use of a blanket and a pillow, and the presence of a higher class of company. Good accommodations are a small, private room with one bed, some amenities, and a covered chamber pot in the corner. Meals: Poor meals might be composed of bread, baked turnips, onions, and water. Common meals might consist of bread, chicken stew (easy on the chicken), carrots, and watered-down ale or wine. Good meals might be composed of bread and pastries, beef, peas, and ale or wine. Rations, Trail: See Adventuring Gear, above. Horses and other mounts let you travel faster and more easily. *A mount wearing heavy armor moves at only triple normal rate when running instead of quadruple. Flying mounts cannot fly in medium or heavy barding. Barded animals require special attention. You must take care to prevent chafing and sores caused by the armor. The armor must be removed as night and ideally should not be put on the mount except to prepare for a battle. Removing and fitting barding takes five times as long as the figures given on Donning Armor. Barded animals cannot be used to carry any load other than the rider and normal saddlebags. Because of this, a mounted warrior often leads a second mount for carrying gear and supplies. Cart: A two-wheeled vehicle drawn by a single horse (or other beast of burden). Is comes with a harness. Feed: Horses, donkeys, mules, and ponies can graze to sustain themselves, but providing feed for them (such as oats) is much better because it provides a more concentrated form of energy, especially if the animal is exerting itself. If you have a riding dog, you have to feed is as least some meat, which may cost more or less than the given amount. Warhorses and warponies can be ridden easily into combat, light horses, ponies, and heavy horses are hard to control in combat (see Mounted Combat, and the Ride skill). Saddle, Exotic: An exotic saddle is like a normal saddle of the same type except that it is designed for an unusual mount, such as a pegasus. Exotic saddles come in military, pack, and riding styles. Saddle, Military: A military saddle braces the rider, adding a +2 circumstance bonus to Ride checks related to staying in the saddle. If you're knocked unconscious while in a military saddle, you have a 75% chance to stay in the saddle (compared to 50% for a riding saddle). Sled: This is a wagon on runners for moving through snow and over ice. In general, two horses (or other beasts of burden) draw it. Is comes with the harness needed to pull it. Stabling: Includes a stable, feed, and grooming. Wagon: This is a four-wheeled, open vehicle for transporting heavy loads. In general, two horses (or other beasts of burden) draw it. It comes with the harness needed to pull it. Backpack 2 gp 2 lb. *** 1 cu. ft.
Barrel 2 gp 30 lb. 10 cu. ft. Basket 4 sp 1 lb. 2 cu. ft.
Bucket 5 sp 2 lb. 1 cu. ft. Chest 2 gp 25 lb. 2 cu. ft.
Pouch, belt 1 gp 1/2 lb. ** 1/5 cu. ft.
Sack 1 sp 1/2 lb. ** 1 cu ft.
Saddlebags 4 gp 8 lb. 5 cu. ft. Spell component pouch 5 gp 1/4 lb. ** 1/8 cu. ft.
**These items weigh one-quarter this amount and carry one-quarter the normal amount when made for Small characters. Over the course of the campaign, prices for items and services not found in the Player's Handbook may be required. The items found below are particularly expensive or not common enough to be included in the lists above. Use them when needed in the campaign, or use them to extrapolate items not found on any list in either hook. Characters may own ships as traders, ship captains, or smugglers, or they may simply need to travel on them. Rowboat: An 8- to 12-foot-long boat for two or three people. It moves about 1-1/2 miles per hour. Galley: A three-masted ship with seventy oars on either side and a total crew of two hundred. This ship is 130 feet long and 20 feet wide, and it can carry up to 150 tons of cargo or 250 soldiers. For 8,000 gp more, it can be fitted with a ram and castles with firing platforms fore, aft, and amidships. This ship cannot make sea voyages and sticks to the coast. It moves about 4 miles per hour when being rowed or under sail. Longship: A 75-foot-long ship with forty oars and a total crew of fifty. It has a single mast and a square sail. It can carry fifty tons of cargo or one hundred twenty soldiers. A longship can make sea voyages. It moves about 3 miles per hour when being rowed or under sail. Keelboat: A 50- to 75-foot-long ship that is 15 to 20 feet wide and has a few oars to supplement its single mast with a square sail. It has a crew of eight to fifteen and can carry forty to fifty tons of cargo or one hundred soldiers. It can make sea voyages as well as sail down rivers. (It has a flat bottom.) It moves about 1 mile per hour. Sailing Ship: This larger, more seaworthy version of the coaster (a kind of sailing ship) is 75 to 90 feet long and 20 feet wide. It has a crew of twenty. It can carry cargo up to 150 tons. It has square sails on its two masts and can make sea voyages. It moves about 2 miles per hour. Warship: This 100-foot-long ship has a single mast, although oars can also propel it. It has a crew of sixty to eighty rowers. This ship can carry up to 160 soldiers, but not for long distances, since there isn't room for supplies for that many. The warship cannot make sea voyages and sticks to the coast. It is not used for cargo. It moves about 2 1/2 miles per hour when rowed or under sail. The most common methods to get from one place to another in a campaign are by foot or on horseback. But other methods may be more expedient. Ship's Passage: Most ships do not specialize in passengers, but many have the capability to take a few along when transporting cargo. Coach Cab: The price listed is for a ride in a coach that transports people (and light cargo) between towns. For a ride in a cab that transports passengers within a city, 1 cp usually takes you anywhere you need to go. Messenger: This entry includes horse-riding messengers and runners. Those willing to carry a message to a place they were going anyway (a crew member on a ship, for example) may ask for half the listed amount. Teleportation: The cost to be teleported is based on caster level, although the customer will have to pay double because the caster will need to teleport herself back. Further, some casters will charge as much as double to teleport into a dangerous area. Road or Gate Toll: A toll is sometimes charged to cross a well-trodden, well-kept, and well-guarded road to pay for patrols on it and its upkeep. Occasionally, large, walled cities charge a toll to enter or exit the city (sometimes just to enter the city). These buildings and structures provide a baseline for those of their type. Heavily customized structures will doubtlessly cost more. Grand House: This four- to ten-room room grand house is made of wood and has a thatched roof. Mansion: This ten- to twenty-room mansion has two to three levels and is made of wood and brick. It has a slate roof. Castle: The castle is a keep surrounded by a 15-foot stone wall with four towers. The wall is 10-feet thick. Huge Castle: A particularly large keep with numerous associated buildings (stables, forge, granaries, etc.) and an elaborate 20-foot-high wall creating bailey and courtyard areas. The wall has six towers and is 10 feet thick. Moat with Bridge: This moat is 15 feet deep and 30 feet wide. The bridge across it may be a wooden drawbridge or a permanent stone structure. Catapult, Heavy: A heavy catapult is a large engine capable of throwing rocks or heavy objects with great force. When fired, one of the crew makes a Profession (siege engineer) check (DC 20). If successful, where the object actually lands is determined by rolling 1d12 and consulting the Deviation (10 Ft. to 16 ft.) Diagram. The center is the desired target. 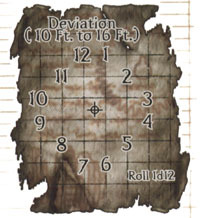 If the check is failed, the DM secretly rolls and consults the same deviation diagram. The result is now where the catapult is actually aimed. This new result is used as the center to determine the actual deviation of the attack. For example, a catapult is used to attack a stone rower. The Profession (siege engineer) check fails, the DM rolls an 11. By consulting the diagram, she determines that the actual target is 10 feet from the desired target, behind and to the left. Now, a crew member rolls 1d12 and gets an 8. After consulting the Deviation (10 ft. to 16 ft.) Diagram to see where the object goes, the DM ascertains that it falls 10 feet short and to the left of the actual target, which is 20 feet to the left of the desired target. Loading the catapult and preparing it to fire takes the full crew 8 full rounds. Initially aiming (or re-aiming) takes 10 minutes in addition to loading and preparation time. Three to four crew members can operate the device in three times this time. Fewer than three crew members cannot operate the device. Catapult, Light: This is a smaller, lighter version of the heavy catapult (see that entry for how to operate it). Two crew members can load and prepare this device in 5 full rounds and aim (or re-aim) in 5 minutes. One person can crew the engine, but it takes three times the time to aim and prepare. Ballista: The ballista is essentially a very large crossbow. It makes attacks with a straight attack roll (1d20) with no modifications (no character base attack bonuses, ability modifiers, etc.) except for range. Loading and cocking a ballista is 3 full-round actions. Ram: This heavy pole is suspended from a movable scaffold that allows the crew to swing it back and forth against construction. Make an unmodified attack roll against the AC of the construction, with failed attempts dealing no significant damage. (See Strike an Object, to determine the AC.) The ram can be used to make an attack every 3 rounds if fully crewed. With five to nine people, it can be used every 6 rounds. Fewer than five people cannot operate it. Siege Tower: This is a large wooden tower on wheels or rollers that can be rolled up against a wall to allow attackers to scale the tower and thus to get to the top of the wall with cover. The wooden walls are usually 1 foot thick. Armor Lubricant: This nonmagical oil reduces the friction that impedes movement in metallic armor. One application of armor lubricant reduces the armor check penalty by 1 (to a minimum of 0). Each application takes 1 minute to apply and lasts 1d4 hours. It is not possible to apply armor lubricant to armor currently being worn. Armor lubricant provides no benefit to shields or to armor not made primarily of metal. Creating one application of armor lubricant requires a successful Craft (Alchemy) check (DC 15) and follows the rules outlined in the discussion of Craft skills. Crystal Caltrops: These special caltrops are made out of a tough crystal. These are deployed just like traditional caltrops. When they score a hit, they do normal damage and release a poisonous gas. The victim must make a Fortitude save (DC 12) or instantly fall asleep for 1 minute. After 1 minute, the target must make another Fortitude save (DC 12) or sleep for an additional 1d4 minutes. The gas affects creatures immune to magical sleep, but not creatures immune to poison. Drogue Wing: This pleated cloak unfurls into a gliding batlike wing 15 feet across if the wearer falls more than 20 feet. A drogue wing needs another 20 feet of falling distance in order to arrest the wearer's fall and unrestricted (at least 50 feet in diameter) gliding room. If all three conditions are met, a drogue wing negates falling damage. Once deployed, a drogue wing must be carefully refolded (a tedious task that requires 1 full hour) before it can be reused. There is a 25% chance that a drogue wing is ruined after each use. Drogue wings are popular among the hippogriff-mounted skyriders of the Great Rift. Footsaw Trap: This item is similar to others of its kind that are typically designed to trap large animals such as bears or cougars. Its jaws are fitted with thin saw blades mounted on springs, and the mechanism is designed to cut the feet of any captive who struggles against its grip. The ghostwise hin did not invent this trap, but they have made excellent use of it: When enemies threaten, they salt the ground near their campsites with these dangerous devices, hiding them under thin layers of leaves or soil. A creature can discover a concealed footsaw trap with a successful Search check (DC 15). Once found, the trap can be disabled with a successful Disable Device check (DC 15). Anyone who walks over a footsaw trap triggers it; the trap makes a melee touch attack with a +8 bonus. If its attack is successful, the trap deals 1d6 points of damage to the victim. A victim caught in a footsaw trap can move at half speed if the device is not attached to another object (such as to a tree or boulder by a length of chain). If it is attached in such a fashion, the victim must break the attachment, otherwise he cannot move. The trap inflicts an additional 1d4 points of damage from the saw blades every round that a trapped victim takes any action that involves movement. A trapped creature can pry open the jaws of the trap and escape (Strength check DC 25) or loose himself with an Escape Artist check (DC 30). Failure means that the trap deals another 1d4 points of damage to the victim and that the victim remains trapped. A footsaw trap is a CR 2 trap. They can be constructed with the Craft (trapmaking) skill (DC 20). Mobile Brace: This small staff can extend and lock at any length from 5 to 11 feet. It is commonly used to make a sturdy brace across a passage, granting a sure purchase for one or more ropes. A properly set brace can support up to 400 pounds of weight (less if the walls are soft, slippery, crumbling, or otherwise offer unsure purchase). Setting a brace allows characters to securely set a rope or grappling hook where doing so would normally be impossible. Adventuring groups can send a skilled climber or jumper to negotiate tricky ascents or dangerous falls, set a brace on the far side of the obstacle, and then give less nimble characters something to hang. on to while they cross the dangerous area. Potion Bladder: This is a flexible, narrow-necked pouch, usually made of oiled leather or the preserved stomach of a small animal. Used extensively by water-dwelling creatures such as aquatic elves, these pouches hold 1 ounce of liquid (the same volume as a potion) and can be squeezed carefully to allow drinking of fluids (such as potions) underwater without spilling. Rope Climber: This hand-held device consists of a powerful winch and locking wheel assembly that fits most standard ropes. When threaded with a rope, the winch offers one-way travel with the benefit of tremendous leverage. Using the climber to ascend a rope grants a +5 circumstance bonus on Climb checks, but it halves the rate of ascent. Threading a rope through the climber is a full-round action, as is removing it from a rope. The locking wheels turn only in one direction, preventing the user from slipping back down the rope. However, this means that for two people to use the same rope climber, one must ascend the rope, remove the device, and lower it back down to the next user. Snowshoes: Fashioned of wood and strips of rawhide or sinew, snowshoes are invaluable for movement across deep snow. Snowshoes eliminate the hampered movement penalty for movement across deep snow but impose a 1/2 movement penalty across other types of terrain (see Hampered Movement). Wagon Shields: These are large wooden shields (generally of solid oak) reinforced with iron. They can be quickly fitted together to protect wagons and similar open-topped vehicles. One person can mount a wagon shield as a full-round action. Two people working together can mount a shield as a standard action. Once mounted, each shield provides a Small character in the wagon with three-quarters cover; a Medium-size character gains one-half cover behind a wagon shield. Each wagon shield has hardness 5 and 30 hit points. Some are fitted with arrow slits to allow those inside the wagon to fire on attackers without additional exposure. Most wagons in Luiren are constructed with special racks beneath the wagon bed that hold six shields. The shields are normally sold in quantities of six, as that is the number required to fully protect the average Luiren wagon. Armor lubricant 40 gp 1 lb. Caltrops, crystal 150 gp 2 lb. Drogue wing 300 gp 30 lb. Footsaw trap 700 gp 15 lb. Mobile brace 10 gp 3 lb. Potion bladder 2 gp 1/10 lb. Rope climber 15 gp 3 lb. Snowshoes 1 gp 2 lb. Standard 75 gp 40 lb. Sniper 100 gp 40 lb. Rangers don't need a lot of equipment to survive in the wilderness, but over the years, many have developed items specifically useful to life in the wilds. Druids and rogues also find these specialty tools handy. Camouflage Clothes: Made in three different color combinations, these clothes help to disguise the body's form and make the wearer harder to pick out of his surroundings. These full-body suits grant a +2 circumstance bonus on a wearer's Hide checks while he is in an area the camouflage blends with. The forest pattern has a mix of greens, browns, and blacks that provides its bonus in forest and marsh terrains. The desert pattern consists of dark and light tans with irregular black or blue shapes that provides its bonus in desert and plains terrains. The mountain pattern consists of a white background with black, gray, and green shapes and provides its bonus in hills, mountains, and underground terrains. The listed price for camouflage clothes is for one set suited to a specific terrain (see the terrain types). Compass, Magnetic: This palm-sized device is made up of a wooden block with a metal needle mounted on a tiny metal post. The needle spins freely, and always points north unless obstructed or within 10 feet of 50 pounds or more of ferrous metal (such as iron and steel). Crookneck Lantern: This leather-wrapped metal tube has a shorter glass-covered metal tube at one end. Small mirrors inside the lantern reflect and intensify the light shed by the candle held within the main body. Shrouded air holes line the top and bottom of both tubes. The crookneck lantern also has a weight at the bottom of the main tube so it can be set down and not fall over. The crookneck lantern clearly illuminates a 60-foot-long, 5-foot-wide line and provides shadowy illumination in a 100-foot cone (with the illuminating line in the center of the cone). A single candle burns for 1 hour. Duster Coat: Made of heavy oiled canvas, the duster is a long coat that reaches to the wearer's ankles. Twin rows of buttons run the length of the front of the coat, and when all of them are fastened the wearer is wrapped in a nearly water- proof shell. A fully fastened duster provides a +2 circumstance bonus on Survival checks made to gain a bonus against the effects of severe weather and on saves against severe weather, but it also imposes a -1 armor check penalty. Finger Chain Saw: A narrow-gauge steel chain covered with small teeth links a metal loop on either end of it. The user simply throws the chain over a branch and pulls back and forth on each end of the chain. It cuts through 2 inches of soft wood and 1 inch of hard wood in 1 round. A finger chain saw is ineffective as a weapon. Kayak, Inflatable: Made of thick but pliant leather forming several air bladders, this vessel looks and acts like a normal kayak once inflated. One character can inflate the kayak in 20 minutes. There are two inflating tubes, so two characters can inflate it in 10 minutes. The inflatable kayak holds one Medium creature plus 100 pounds of gear. By pulling the plugs on the air bladders, the kayak deflates in 5 minutes and can then be folded and carried in a standard backpack. The inflatable kayak comes with a short paddle that breaks down for easy storage. Vest, Tactical: This light vest has a number of pouches and loops covering its front and back. A tactical vest is usually made of green or black canvas. It can hold up to 10 pounds of gear, no single item of which can weigh more than 2 pounds. Any item stored in a tactical vest can be retrieved without provoking an attack of opportunity. Waking Herbs: When waved under the nose ot someone unconscious or asleep (even through magical means), these herbs allow the unconscious or sleeping character another saving throw (made at the original DC) to wake up. After three uses, these herbs lose their effectiveness and must be replaced. Camouflage clothes 150 gp 6 lb. Compass, magnetic 100 gp 1/2 lb. Duster coat 25 gp 7 lb. Kayak, inflatable 150 gp 35 lb. Vest, tactical 5 gp 2 lb. Although magic is the most efficient and powerful force available to help the denizens of the frostfell adapt and thrive in this harsh environment, it remains an elusive factor, available only to those fortunate enough to understand its use, or those rich enough to be able to buy what magic they may need. For the rest of the inhabitants of the frostfell (the majority of them, in fact), mundane items must fill this role. As a result, your equipment can make the difference between life and death. In frontier towns, such items aren't as necessary, but to the explorer, settler, and native denizen, frostfell equipment is incredibly important. Weapons aren't the only objects that the people of the frostfell have developed to aid their lives. Industrious settlers have invented numerous specialized items over the years, most of which are now fairly commonplace in the frostfell. These items are detailed here. Crampons: Crampons consist of a set of metal spikes and hooks that lash on to boots and gauntlets to assist in climbing or walking across icy surfaces. While you wear crampons, you gain a +2 circumstance bonus on any Balance checks made to avoid slipping on an icy surface, and a +2 circumstance bonus on Climb checks. Crampons impose a -10 ft. penalty to speed when not walking on snow or ice. Fur Clothing: Fur clothing consists of thick layers of animal furs designed to be worn over a regular set of clothing or armor. Wearing fur clothing grants a +5 circumstance bonus on Fortitude saving throws against exposure to cold weather. Fur clothing can be worn over a cold weather outfit; in this case the circumstance bonuses granted by each item stack, granting a total +10 circumstance bonus on Fortitude saving throws against exposure to cold weather. Fur clothing is cumbersome to wear. Although the furs do not provide an appreciable armor bonus, they do increase your total armor check penalty for any armor worn by 2 points. Hut, Portable: A portable hut consists of a wooden framework that can be quickly assembled into a hut-shaped frame that covers a 10-foot square. The frame's base consists of several iron spikes that can be driven through holes in the frame to affix the hut frame to the ground; further stability is granted by several rope supports that extend out 15 feet from the hut's edge. Once the frame is in place, you simply attach the leather and fur wrappings over the outside of the wall and lash them directly to the frame to finish building the hut. A portable hut provides excellent shelter in the wilderness; assembling or disassembling a portable hut only takes 15 minutes of work. A portable hut serves as an improvised shelter (see Frostfell). Skates: Skates allow full movement across icy surfaces for anyone with at least 5 ranks of Balance, but cannot be used at all on any other terrain. Skis and Poles: Skis allow full movement across snow and icy surfaces but cannot be used at all on any other terrain. Downhill speed can be as a run (x4) on slight grades or as a run (x5) on severe grades. It takes a full-round action to don or to remove skis. Snow Goggles: These wooden goggles have a thin horizontal slit in the middle. They grant a +2 circumstance bonus on saving throws to resist blinding effects, including snow blindness, extremely bright light, or spells that target vision indirectly (such as sunburst but not blindness). While wearing snow goggles, you incur a -4 circumstance penalty on Spot and Search checks. Snowshoes: These allow the wearer to move across snow and ice with increased speed. Snow of any depth is considered a minor impediment (see Movement Impediments). Snowshoes take 1 minute to don and a full-round action to remove. Winter Fullcloth: This is a heavily quilted undergarment that is worn underneath regular clothing to protect the wearer against cold. Winter fullcloth is considered part of the cold weather outfit described above. If worn by itself, it grants a +1 circumstance bonus on Fortitude saving throws against exposure to cold weather. Crampons 5 gp 1 lb. Fur clothing 8 gp 10 lb. Hut, portable 125 gp 75 lb. Skates 10 gp 3 lb. Skis and poles 15 gp 6 lb. Snowshoes 15 gp 8 lb. Winter fullcloth 4 gp 2 lb. Distillation Kit: Water is precious in the waste. This simple kit uses the sun and the ambient heat to evaporate pure water from body or cooking waste, salt lakes, poisonous plant saps, and so on. This "solar still" consists of a sheet of glass fastened at an angle into a frame, with a lip and a small spout (the components are packed separately and assembled when needed). The bottom and sides of the frame are covered with black oilcloth, the edges sealed with grease or tar to make it watertight. To use the still, pour the dirty water into the bottom of the container, then place the glass lid on top. The water evaporates and condenses on the underside of the glass surface, where it runs down and collects in the lip, dripping through the spout and producing about 1 gallon of water per day (if the container is filled to capacity). Drill: Whether they are used to carve sandstone, locate water, or mine salt and other precious minerals, drills are important tools in any wasteland environment. These objects can range from a primitive bow drill, suitable for perforating bone and wood, to a massive assembly of cast-iron pipes and bits, turned by wheels or beasts of burden. The drill described here is made of iron with a wooden handle, about 3 feet long. (In metal-poor areas, the bit might be of hard crystal instead of iron.) Wrapping a cord about the shaft and pulling it sharply sets the drill spinning. It can penetrate roughly 6 inches of stone per hour; the rate of drilling is faster in softer material, such as salt. A drill can be used as an improvised club or shortspear. Filter Mask: A filter mask is a fine cloth mesh, usually of silk or cotton, that covers your mouth and nose. Cords or straps fasten the cloth around the back of your head to provide a good seal. A filter mask grants a +2 bonus on saves against gas-based effects. It negates the effects of suffocation from dust and sand, as well as the effects of supernatural or magic dust (such as slumber sand) for up to 4 hours. After this time, the mesh is clogged with grit and can no longer allow air to pass through freely. A clogged filter mask requires thorough laundering before it can be reused, but most travelers simply replace it with fresh fabric. Parasol: The simplest form of portable shade, a parasol can range from an animal hide draped over a crude framework to a collapsible construction of textile and metal The typical parasol described here is made of stretched canvas over wood or bone. A parasol offers immunity to sun glare and limited protection from heat dangers and some sun hazards. It also grants a +1 bonus on Fortitude saves against dehydration. Sand Tube: When a storm scours the land, the best defense is to escape. Burrowing into the ground is one way to do this, but sand is loose and difficult to stabilize. This handy device enables you to create a burrow beneath the sand, in which you can rest while waiting for the storm to pass. A sand tube looks something like an open-ended sleeping bag, made of treated hide attached to a number of collapsible hoops. After digging a small hole in the sand to get started, you shove one end of this apparatus inside the hole and expand the hoops to stiffen it into a tube. More sand can then be dug from the buried end (usually you crawl partway into the tube and use your hands) and removed through the tube, which is shoved more deeply into the tunnel as digging progresses. In normal sand, it takes 10 minutes of digging to fully bury a sand tube. When fully buried, a sand tube can hold one Medium humanoid. A flap fastens over the exposed end to provide shade and protection from duststorms and sandstorms. Sun Lenses: This item, made of thin slabs of mica or volcanic glass affixed to curved frames, can protect your eyes from being dazzled by bright light, such as glare. If you are already dazzled when you don the lenses, you are treated as if you had entered an area of shade; you recover from the dazzled condition 1 hour if you continue to wear the lenses. Proper clothing can be the difference between survival and disaster in the wastes. Desert Outfit: This outfit consists of loose, billowy clothing to keep the wearer cool and protected from the sun while in hot, dry desert terrain. It includes a caftan, turban, scarf, loose pantaloons, and sandals or high cloth boots. This outfit counts as light clothing and offers limited protections against some waste hazards. The protection it offers against heat is negated if the wearer also dons armor. Heatsuit Outfit: This suit is designed to protect against heat It consists of heavy pants and coat, a specially treated leather apron, thick mittens, a thick hood, and goggles. A heatsuit outfit prevents 3 points of lethal or nonlethal damage per round from hot environments. Although the outfit is heavy clothing, its heat-resistant materials negate the usual -4 penalty on Fortitude saves against damage dealt by hot environments. Hydration Suit: The hydration suit is a masterpiece of water retention, crafted by waste-dwellers with technical skill and unusual materials. Its design allows you to recover nearly all the water your body loses through sweat and exhalation. A hydration suit is made of the skin and tissue of various desert-dwelling beasts and treated with oils or waxes for water retention. It covers your entire body, with a tight-fitting hood over the head and a mask covering the mouth and nose. Inside the mask is a glass plate to collect condensation and a tube fashioned from watertight materials. An inner lining wicks sweat away from your body and collects it in spongelike filtration material that can be removed after you doff the hydration suit. The tube from the facemask twists in loops around your body, through the sponge, to reclaim moisture, condensing it in a reservoir from which you can sip. A functioning hydration suit eliminates the need to make Constitution checks to avoid dehydration. It raises the level of protection from heat dangers by two steps, and its mask functions as a filter mask. A hydration suit offers no protection from magical dessication damage. Distillation kit 50 gp 20 lb. Drill 5 gp 7 lb. Parasol 3 gp 2 lb. Sand tube¹ 80 gp 5 lb. Desert outfit¹ 6 gp 3 lb. Heatsuit outfit¹ 20 gp 15 lb. Hydration suit¹ 1,000 gp 10 lb. In the wastes, if you can't go where you need to by camel - whether because of excess gear or distance - you'll need some other form of transport. Some vehicles, such as the frame wheel and sledge, are moved by muscle power. The Handle Animal skill is used only if that power comes from a team of draft animals. When the team consists of creatures with Intelligence scores of 3 or higher, the operative skill is Diplomacy. When they are forced labor, the operative skill is Intimidate. Cloudskate: Huge vehicle; Profession (sailor) +2; Spd wind x 10 ft. (nautical good) or 20 ft. during daylight; Overall AC 1; Section hp 40 (hardness 5); Section AC 3; Rigging 30 hp (hardness 0), AC 3; Ram 4d6; Space 20 ft.; Height 10 ft. (draft 5 ft.); Crew 4; Cargo 10 tons; Cost 3,000 gp. This vehicle is similar to a small keelboat - it is a 20-foot ship without oars - except that it has stabilizing runners along each side. It has a single mast on which a sail can be set. A blade is sturdily mounted on the bottom exterior of the vehicle, running the whole length of the hull, and similar blades are attached to each runner. The rudder is another blade that drags behind the ship, allowing it to be steered. This configuration allows the vehicle to skate on glass seas at a rate of 1 to 3 miles per hour. An empty cloudskate can carry up to twenty passengers. Frame Wheel: Large vehicle; Handle Animal +2, Diplomacy +2, or Intimidate +2; Spd drawn (poor); Overall hp 15 (hardness 5); Overall AC 3; Ram 3d6; Space 10 ft.; Height 10 ft.; Crew 1; Weight 300 lb., Cargo 4 tons; Cost 15 gp. A frame wheel consists of a pair of wooden wheels constructed around a large, heavy object, such as a block of stone. The wheels cap the ends of the object and keep it off the ground, allowing the object to be rolled along like an oversized log. Like a sledge, a frame wheel can be drawn by beasts of burden or by people and is difficult to steer, but it moves more easily up and down slopes than a sledge does. The major drawback of a frame wheel is that it is usually only good for a single load, after which it has to be disassembled, returned to the point of departure, and built all over again around a new load. When multiple loads are of a uniform size, however, the same set of wheels can be used many times. Sand Skiff: Large vehicle; Profession (sailor) +2; Spd wind x 30 ft. (nautical good); Overall AC 3; Section hp 15 (hardness 5); Rigging 10 hp (hardness 0), Section AC 3; Ram 2d6; Space 10 ft.; Height 5 ft.; Crew 1; Weight 200 lb., Cargo 500 lb. ; Cost 150 gp. This lightweight framework rests atop a pair of polished runners and sports a single tall sail. Designed for a single rider, a sand skiff is useful for scouting, carrying messages, and as entertainment. The major advantage of the sand skiff lies in how easy it is to construct, though the major disadvantage is that those with the appropriate skill to pilot them are few and far between in the wastes. A sand skiff moves 3 to 10 miles per hour, depending on the wind, and requires flat, open sand which to move. Sand Schooner: Gargantuan vehicle; Profession (sail +2; Spd wind x20 ft. (nautical average); Overall AC - Section hp 25 (hardness 5); Rigging 15 hp (hardness 0 Section AC 3; Ram 8d6; Space 40 ft.; Height 15 ft.; Crew 15; Cargo 50 tons; Cost 8,500 gp. Though rarely seen, the sand schooner is a popular vehicle among certain deep-desert denizens, who use it as a merchant vessel and as a warship. A sand schooner has enough room on its deck for two light catapults or ballistas. Because ships that travel on sand need not worry about sinking, a schooner's cargo holds have additional hatches located on either side of the hull. These two doors are built to pivot downward and create a simple but effective cargo ramp. A sand schooner moves 2 to 7 miles per hour, depending on the wind, and requires flat, open sand on which to travel. Sand Galley: Colossal vehicle; Profession (sailor) -2; Spd wind x 10 ft. (nautical poor); Overall AC -3; Section hp 25 (hardness 5); Rigging 15 hp (hardness 0), Section AC 1; Ram 10d6; Space 60 ft.; Height 20 ft.; Crew 25; Cargo 100 tons; Cost 16,000 gp. A step up from the sand schooner, the sand galley is specifically designed as a warship. It has sufficient deck space to accommodate three heavy catapults or six ballistas or light catapults. Much of the vessel's cargo space is often used for troops rather than for stores or merchandise. Like a sand schooner, a sand galley has one bulkhead on either side of the hull that opens downward to act as a ramp - in this case, facilitating the swift deployment of soldiers. A sand galley moves 1 to 3 miles per hour, depending on the wind, and requires flat, open sand on which to travel. Sledge: Large vehicle; Handle Animal +2, Diplomacy +2, or Intimidate +2; Spd drawn (clumsy); Overall hp 40 (hardness 5); Overall AC 4; Ram 2d6; Space 10 ft.; Height 1 ft.; Crew 1; Weight 500 lb., Cargo 2 tons; Cost 15 gp. A primitive conveyance still used in many parts of the wastes, especially in sandy areas, the venerable sledge is popular because it does not become mired in sand a easily as wheeled vehicles can. Consisting of a flat expanse of reinforced wood, a sledge is really just a convenient platform for heavy loads; one can stack up to two tons of material on a sledge and push or pull it all at once. The "driver" of a sledge rarely rides upon the vehicle, but instead paces back and forth between groups of workers or animals that are doing the work, coordinating the team. Why settle for a chariot when you can purchase an ethereal tunneler or a gate zeppelin? By using the vehicles described here, characters can go anywhere - assuming they have the cash to pay for such an extravagance. Astral Skiff: Huge vehicle; Profession (sailor) +0; Spd fly 120 ft. (average); Overall AC 3; Section hp 40 (hardness 10); Section AC 3; Ram 4d8; Face 15 ft. by 5 ft.; Height loft. ; SA ramming; Crew 1 (carries 3); Cargo 1 ton (Spd 100 ft. if carrying 1/2 ton or more); Cost 10,000 gp. On the Astral Plane, githyanki commonly wage war from astral ships. Such vessels range in size from those large enough for a, single squad of soldiers (the astral skiff) to those far larger. Powered by magic sails that catch the motion of astral energies, these ships are normally useless on the Material Plane, where no such arcane winds blow. However, the vehicle is ideal for journeys on the infinite Astral Plane itself. Ethereal Tunneler: Huge vehicle; Profession (miner) +4; Spd burrow to ft. (clumsy); Overall AC 3; Section hp 40/120 (hardness 20/5); Section AC 3; Ram 10d6; Face 10 ft. by 20 ft.; Height 10 ft.; SA ramming; SQ steering mechanism triggers ethereal jaunt on vehicle and all passengers 1/day for up to 20 rounds; Crew 5 (plus 10 soldiers); Cost 140,000 gp. This tank-like vehicle slowly digs tunnels through earth - and when solid stone stymies it, the vehicle can briefly shift into the Ethereal Plane. When not tunneling into otherwise sealed regions of earth or past undefeatable defenses, an ethereal tunneler can be used for outright warfare. The vehicle is adamantine-armored and large enough to accommodate a squad of 10 soldiers. Its treads have been magically animated to provide propulsion at the direction of the crew, who pull levers while they watch the earth for signs of cave-ins. The massive drill at the front is better than a ramming prow; an ethereal tunneler never takes damage from rams it initiates. Gate Zeppelin: Colossal vehicle; Profession (pilot) -4; Spd fly 40 ft. (nautical average); Overall AC -3; Section hp 30 (hardness 5); Section AC 3; Rigging 200 hp (hardness 0), AC 1; Ram 4d6; Face 40 ft. by 10 ft.; Height 10 ft; SA ramming; SQ steering mechanism triggers gate 1/day through which zeppelin may pass (after which the gate closes); Crew 10; Cargo 10 tons (Spd 20 ft. if carrying 5 tons or more); Cost 160,000 gp. A zeppelin relies on hot air trapped in a massive balloon for lift and animated propellers for propulsion. The balloon that provides lift is segmented so that one puncture isn't disastrous. Zeppelins have no minimum forward speed, and they can hover. A mechanism in the captain's cabin can trigger a gate-like opening once per day that allows planar travel. Living Astral Ship: CR -; Colossal construct; HD 8d10 + 1d10 per 10 feet of length; Init as the pilot - 4; Spd as the pilot (+30 ft. with psychic sails) on the Astral Plane, fly 50 ft. (poor) in a gravity well; AC varies (-8 size, +1 natural per HD); At as cleric of level equal to the ship's HD; Space/Reach 30 ft/10 ft. (or as ram); SA ram, mounted weapons; SQ construct traits, hardness; Al n/a; SV as commoner of level equal to the ship's HD, with no ability score modifiers. Construct Traits: like most constructs, living astral ships have immunity to mind-affecting spells and abilities, poison, disease, and similar effects. They are not subject to extra damage from critical hits, nonlethal damage, ability damage, ability drain, energy drain, or death from massive damage. Hardness: A living astral ship is usually composed of different materials but has an overall hardness of 5 to 10. An astral ship composed mainly of wood might have hardness 5, while an astral ship made of iron would have hardness 10. See Smashing an Object, for more information on hardness. Mounted Weapons: A living astral ship can be fitted with heavy catapults, light catapults, and ballistas. An astral ship can have one mounted weapon for every 2 Hit Dice it possesses, although nonmilitary astral ships typically forgo a full array of weapons in favor of having cargo space. A heavy catapult counts as two weapons for the purpose of determining how many weapons an astral ship can carry. Ram (Ex): In any round in which no ship-mounted weapons are fired, a living astral ship can ram a Huge or larger creature or object. If the prow of the astral ship is more than 50 feet away in a straight line from a target, it can move up to double its speed to deliver a ram attack using its regular attack bonus. The ram deals either bludgeoning or piercing damage, depending on the shape of its prow. The damage dealt is idio points per point of the astral ship's hardness. For example, an astral ship with hardness 10 deals 10d10 points of damage with a successful ram attack, or triple damage on a critical hit (threat range 20). Building a living astral ship requires the Craft Construct feat and 10 ranks in Knowledge (the planes). Flying the ship requires the pilot (who must have an Intelligence score of 1 or higher) to sit in a specially attuned chair called a helm. The helm allows the pilot to propel the ship by thought at a speed (in feet) equal to 10 times the pilot's Intelligence score. When the ship passes within a gravity well, such as that generated by a large chunk of drifting matter, it slows to a speed of 50 feet. A living astral ship can move at double speed and running speed. Piloting the ship is always considered a full-round action, and the pilot cannot engage in other activities while controlling the ship. A pilot seated in the helm receives a 360-degree mental picture of the area around the ship, out to normal visibility range. The pilot feels as if he or she is flying directly over the ship and able to look in all directions at once. The helm radiates strong transmutation magic under the scrutiny of detect magic. It serves as a conduit between the pilot and the vessel and is rooted to the ship. Destroying any part of it (the seat itself or the parts connecting it to the rest of the ship) renders the vessel powerless and inert. A helm has the same hardness as the rest of the astral ship and hit points equal to three times the ship's hardness. Rarely sold on the open market, living astral ships can find their way into someone's hands by theft or other means. Planar Sailer: Colossal vehicle; Profession (sailor) +4; Spd wind x 20 ft. (nautical average); Overall AC -3; Section hp 50 (hardness 5); Section AC 3; Rigging 80 hp (hardness 0), AC 1; Ram 12d6; Face 80 ft. by 20 ft.; Height 10 ft. (draft 10 ft.); SA ram; SQ steering mechanism triggers special plane shift effect on vehicle and contents; Crew 20; Cargo 150 tons (Spd wind x 15 ft. if 75 tons or more); Cost 25,000 gp. In most situations, a planar sailer seems no different from a common sailing ship. Measuring some 80 feet in length, this three-masted ship requires a crew of 20 when sailing on water and using the wind for locomotion. A planar sailer has a special ability that allows it to sail celestial seas, following the commands of the captain of the vessel as he stands at the wheel. A planar sailer has enough room on deck for two light catapults or ballistas. It usually uses a launch as a lifeboat (not included in the price). Sometimes, the best way to get from here to there is to hire someone else to take you. Since the player characters are adventurers, such solutions should be the exception rather than the rule, but at times the PCs might prefer to use their monetary resources to advance their agenda. Cubic Gate: Occasionally, a group or individual will offer transport via a cubic gate. These conduits often lead from one well-guarded location in a planar metropolis to a sheltered or protected spot in the same or another metropolis. Passage: Ships (and elsewhales) that provide passage to alternate planes usually do not specialize in passenger service. However, they may have a regular planar trade route on which they are willing to take on passengers in order to supplement their income. Thus, although PCs might not often find passage directly to the plane they are seeking, they may be able to ride on a planar ship for one leg of the journey. Planar Allies: The planar ally spells are common ways to secure travel. Many outsiders have planar travel capabilities either because of spell-like abilities or spellcasting talents. Most are willing to offer the service. A planar ally naturally prefers to bring passengers to a plane that corresponds to its philosophical viewpoint, but one might happily transport a person or group to an opposing plane if doing so furthers one of its causes. Planar Guide: Certain people have a knack for finding the cracks and chinks between planar borders. They know the portals, the vortices, the trade routes, and the other means for traveling the planes that don't involve spells or other magic. Finding a guide is the hard part; after that, a guide worth her salt can lead a party to a plane she claims as her specialty in 2d6 days, or refer the PCs to another guide if the plane they seek falls outside her knowledge. Most guides claim a specialty in the connections between only three to four planes. Planar Ring Gates: Some enterprising wealthy merchant guilds or consortiums have established pairings of planar ring gates. These lead from one well-guarded location in a planar metropolis to a similarly protected spot in another. On occasion, the owner of a pair of planar ring gates may move them to a requested location, provided that the task is easily done and that the new environment is safe. The larger the risk, the larger the cost. Spellcasting: Sometimes the easiest way to reach a planar destination is to pay someone to cast either a gate spell or a plane shift spell. ¹Includes cost for caster's return trip. Air Plant: The air plant is a bizarre form of pond vegetation whose spongy structure produces and stores air, keeping the plant at the surface so it can receive adequate light. This mass remains alive and continues to produce air even after being cut from the plant, provided it is kept moist and well lit. When placed in the mouth, a fist-sized piece of this material can provide enough air to sustain a Medium air-breathing creature for 5 minutes. After that time, the submerged creature must begin holding its breath and risks drowning. The air plant dies after use and can't be recharged - another portion must be procured. Float Bladder: This is an emergency flotation device for those who find themselves cast overboard. It can also be used to support a non-swimmer being assisted through water. A float bladder is a sack of oiled hide that can be filled with air. It has a long neck that is knotted shut after filling and ropes or straps to fasten it to the wearer. A float bladder can keep afloat one Medium creature. Treat this as a leather object (hardness 2); if it takes 5 or more points of damage, the skin is punctured. The round after puncturing, the user must begin making Swim checks to remain afloat. A punctured or deflated float bladder is a burden to a swimmer, imposing a -2 penalty on Swim checks if it is not removed. Sextant: A sextant is a sophisticated device used to determine a vessel's position by measuring the angle formed by the sun or stars and the horizon. It uses mirrors and carefully graduated scales to sight a heavenly body, whose position is compared to a listing in an almanac for the day and year of measurement. A sextant grants a +2 circumstance bonus on Knowledge (geography) checks to set and hold course. Swimming Goggles: This is a leather frame containing a clear piece of glass (sometimes two) made to fit tightly over the eyes. Wearing a set of swimming goggles improves visibility underwater. In clear water, the wearer's vision extends to 6d8x10 feet. Swimming goggles don't make it any easier to see through murky or fast-moving water. Hat, Bicorne: A bicorne is a semicircular hat usually worn by captains and admirals. It is braided and showy the better to call out the high rank of its wearer. Hat, Tricorne: A tricorne is the classic three-cornered hat. It is generally worn by the upper classes and can be both civilian and military garb. A tricorne can range from a simple leather or felt version to a very fancy silk item with leather. The price given here is for a well-made felt tricorne. Oilskin Suit: Inhabitants of rainy climates and misty seacoasts, and those who make their living from the sea, need reliable clothing to keep out the dampness and chill. An oilskin suit consists of high boots, heavy trousers, a long coat or cape, and a wide-brimmed hat. These garments are made heavy-duty cloth such as cotton or linen, then waterproofed with flaxseed oil. Stinkpot: This is a simple chemical weapon, consisting of a clay jar filled with a mix of noxious substances. When set alight, the mixture produces a foul-smelling smoke fills a 10-foot cube (as a fog cloud spell, except that a moderate or stronger wind disperses the smoke in 1 round). Fa living creature within the smoke must succeed on a 15 Fortitude save or become sickened as long as it remains and for 1d4+1 rounds after it leaves. Each round a creature remains within the smoke, it must make another save. The pot's contents are consumed in 3 rounds, and vapors disperse naturally. lighting a stinkpot is a standard action that provokes attacks of opportunity. Float bladder 10 gp 3 lb. Swimming goggles 15 gp 1/2 lb. Hat, bicorne¹ 50 gp 1 lb. Hat, tricorne¹ 15 gp 1 lb. Oilskin suit 10 gp 10 lb. Sextant 250 gp 10 lb. Stinkpot 50 gp 20 1 lb. - No weight, or no weight worth noting. ¹These items weigh one-quarter this amount when made for Small characters. There are basically two types of dungeoneering equipment: highly specialized items that fulfill a narrow purpose, and ordinary objects that can be used creatively. Both are crucial to any adventurer's standard gear. The following mundane items can be put to good use in dungeons. Collapsible Pole: This 2-foot-long wooden pole is composed of six telescoping sections that allow it to extend to a length of 12 feet. Each section can be turned to lock it in place to prevent the pole from collapsing prematurely. The pole can be partially extended to 4 feet, 6 feet, 8 feet, or 10 feet. You can use the pole to jam doors, pass objects across pits, spring traps, or serve any other needed function. The thinnest section of a collapsible pole can be inserted into a second pole, creating a sturdy pole of up to 22 feet in length. Expanding or collapsing a pole is a full-round action. Drill: This simple hand drill bores small holes in wood, metal, or stone. As a standard action, you can use the drill to create a hole in an object if the drill can ignore the object's hardness (see below). The hole is 1 inch deep and 1 inch in diameter. Any Search checks or Spot checks through the hole are made at a -5 penalty. Listen checks through the hole are made at a -2 penalty. There are three types of drills. A wood drill ignores up to 5 points of hardness when drilling. An iron drill, commonly used on metal or stone, ignores up to 10 points of hardness. An adamantine drill, used on only the most difficult surfaces, ignores up to 20 points of hardness. A drill that does not ignore enough hardness of an object cannot bore a hole in that object. Standard drills become dull after 20 rounds of use; masterwork drills last for 100 rounds. New bits can be purchased for 10% of the cost of the drill. Finder's Chalk: Marks made by this red chalk fade from casual view after 1 minute, allowing you to mark dungeon surfaces secretly. The chalk lets you keep track of what areas you have and have not visited without alerting wandering creatures to your presence. To detect a simple mark, such as a line or an X, make a successful DC 25 Search check. To detect more complex marks, make a successful DC 40 Search check. A finder's glass (see below) improves your ability to detect the chalk marks. True seeing lets you detect the marks without making a Search check. One piece of finder's chalk covers a 10-foot-square wall with marks. Finder's Glass: A finder's glass is a 3-inch-diameter circular disc of red glass set in a copper frame. It can be held in front of your eye or inserted over the aperture of a standard bullseye lantern, causing it to emit dim red light. When you look through a finder's glass, you gain a +30 alchemical bonus on your Search checks to find or read marks made by finder's chalk. If the glass is used in conjunction with a lantern, all creatures in the area of bright illumination gain a +20 alchemical bonus on their Search checks to find or read such marks. Flotation Bladder: This item, used to aid in swimming, consists of two sealed, oiled leather sacks attached with a piece of rope. Each sack can be inflated by blowing air into it through a small metal valve as a full-round action. Once inflated and placed under the arms, a flotation bladder grants a +4 bonus on Swim checks to rise to the surface or remain at the surface. The bladder also imposes a -4 penalty on Swim checks to descend deeper into the water. Additional bladders do not grant further bonuses on Swim checks, but the penalties stack. Flour Pouch: This deceptively simple burlap satchel of flour is tied loosely on purpose. While it could be used to bake a loaf of bread on a particularly long expedition, its true purpose is to locate invisible opponents. You can attempt to strike an invisible opponent with a flour pouch as a touch attack. You still must pinpoint the target or choose a space to attack into, and the normal miss chance for total concealment applies. If you hit the target, the pouch bursts open, spilling white flour over a portion of the invisible creature. You can also throw a flour pouch as a splash weapon; any invisible creature standing in the space struck is covered in flour, as are all other creatures within 5 feet. Coating an invisible creature in flour lets you keep track of its position and reduces the miss chance to 20% (instead of the normal 50% for total concealment). While an invisible creature is coated in flour, its bonus on Hide checks is reduced to +10 if the creature is moving, or to +20 if it is not moving. If the creature moves through water, is subjected to a gust of wind, or spends a full-round action brushing the flour off, all the flour is removed from its body. Grappling Hook, Mithral: A mithral grappling hook is lighter than a standard hook but just as strong, and it can be thrown farther. If the hook is attached to a silk rope (not a hempen one), any Use Rope check to seat the hook is made at a DC equal to 10 + 1 per 20 feet thrown, to a maximum DC of 20 for a hook thrown 200 feet. Grappling Ladder: This premade hemp rope ladder has two small steel grappling hooks on either end. Throwing a grappling ladder is like throwing a grappling hook, only more difficult. The Use Rope check to seat the ladder is made at a DC equal to 15 + 3 per 10 feet thrown. A DC 10 Climb check is required to scale a grappling ladder. The price and weight in Table 2-1 is for a 10-foot ladder, but longer ladders are commonly available. For each additional 10 feet of the ladder, add 35 gp to the cost and 6 pounds to the weight. Grappling Ladder, Silk and Mithral: The finest grappling ladders are made of silk rope and fashioned with two tiny mithral hooks. They function as standard grappling ladders but are easier to seat; the Use Rope check is made at a DC equal to 13 + 2 per 10 feet thrown. The standard +2 circumstance bonus on Use Rope checks for silk rope does not apply. The price and weight in Table 2-1 is for a 10-foot ladder, but longer ladders are commonly available. For each additional 10 feet of the ladder, add 150 gp to the cost and 3 pounds to the listed weight. Hacksaw: This blade is designed to cut through thin metal. It ignores the hardness of standard metal objects (excluding exotic metals such as mithral or adamantine), but it deals only 1 point of damage per 2 rounds of sawing. A common blade lasts for 20 rounds, while a superior blade lasts for 40 rounds. You can also buy a hacksaw with an adamantine blade, which ignores hardness 25 or lower. The saw also cuts faster, dealing 1 point of damage per round. Lard: Simple cooking lard can be a great aid to dungeoneers. You can spread it on the floor to make a slippery area similar to that created by a grease spell. Applying lard in this manner takes 1 minute, but the coated area remains slippery for 1 hour. You can also take 1 minute to coat yourself in lard, which grants you a +5 circumstance bonus on Escape Artist checks and on grapple checks made to resist or escape a grapple or pin. The bonus lasts for 10 minutes. Listening Cone: This iron cone can be placed against a surface, such as a door, to aid in Listen checks made through the surface. The DC for listening through a door when using a cone increases by 2 (rather than 5), and the DC for listening through stone walls increases by 5 (rather than 15). Listening cones have no effect if not used against a surface. Magnet: This magnetized bar of metal picks up small objects of ferrous metal, such as iron or steel. The magnet can lift up to 2 pounds of metal if touched to the object in question. It can also attract metal objects weighing up to one-third of a pound at a distance of 1 foot. You can tie a magnet to the end of a piece of twine and lower it into a pit to pick up objects or manipulate levers. You can also lash a magnet to the end of a pole and slide it under doors to retrieve items. Manacles, Adamantine: Intended for chaining powerful dungeon monsters, these manacles can be broken only with a successful DC 52 Strength check. They have 15 hit points and hardness 20. Otherwise, adamantine manacles function as masterwork manacles. Periscope, Hand: This device consists of two steel mirrors placed opposite each other at angles, separated by a metal tube about 2 feet in length. The periscope allows you to peer around corners without revealing your presence. Because only the end of the periscope protrudes, you can make a Hide check (with a +7 bonus) for the item to determine if the creatures you spy upon notice it. The area visible through the periscope is cone-shaped and begins in the space immediately around the corner. While looking through the periscope, you take a -8 penalty on Spot checks to detect creatures not in the cone-shaped area. Rubber Ball: A bouncing rubber ball can give you an idea of what lies down a corridor. Simply throw the ball at a space or grid intersection as you would throw a splash weapon, though with a range increment of 30 feet. No matter where the ball lands, it bounces directly away from you, traveling half the distance it was first thrown. Then it lands and bounces again, covering half the distance of the previous bounce. The ball continues in this manner until it makes a bounce that would be less than 5 feet in length, at which time it stops bouncing and begins rolling. If the ball strikes a solid object, it reverses direction and continues rolling. Thus, you can throw a rubber ball down a corridor to see whether or not it hits a wall and returns to you. Either way, you learn something about the length of the hallway. When you throw the ball, you can also listen carefully for other cues, especially if the ball does not return. For example, if you hear a splash, you know that a liquid obstacle lies ahead. Rubbing Kit: Adventurers often encounter ancient carvings and runes that they do not understand. A rubbing kit allows them to bring a copy of the runes back to town for an expert to translate later. The kit consists of a roll of thin paper 20 feet long and 1 foot wide, and numerous sticks of fine charcoal. Simply place the paper over the carvings and rub it with charcoal. Creating an accurate copy requires 1 minute for each foot of paper used (in length). Rubbing more quickly reduces the time to a full-round action for the same amount of paper, but it adds 10 to the DC of any check related to interpreting the rubbing, such as a Decipher Script check. Spike, Iron: Iron spikes have a variety of uses, though they are most commonly hammered into door frames to keep the doors shut. If you have a hammer or mallet, you can pound one spike in place as a full-round action. A door with one spike in it is considered stuck, and a door with two or more spikes in it is considered locked for the purpose of breaking it down. (For the break DCs for stuck and locked doors, see Doors). Twine: For situations where rope is too bulky, simple twine is a good substitute. It can be tied around smaller objects and takes up less room. Twine has 1 hit point and hardness 0. Wand Bracer: This metal forearm band takes up space on the body as a bracer and can hold up to five wands. Thin loops of thread fit over your fingers, each connected to a spring mechanism on one of the wand slots. If your hand is empty, you can flex a finger as a swift action to cause the wand of your choice to spring into your grasp. You still must activate the wand as a standard action. Replacing a wand in the sheath is tricky and requires a full-round action Most adventurers just drop the first wand to the ground (a free action) when they need a different one. Collapsible pole 20 gp 8 1b. Adamantine 200 gp 1 lb. Iron 10 gp 1 lb. Finder's glass 400 gp 1/2 lb. Flotation bladder 2 gp 2 1b. Grappling hook, mithral 1,000 gp 2 lb. Grappling ladder 40 gp 8 lb. Silk and mithral 650 gp 4 lb. Adamantine 600 gp 1 lb. Common 5 gp 1 lb. Superior 20 gp 1 lb. Listening cone 8 sp 1 lb. Magnet 20 gp 2 1b. Manacles, adamantine 2,000 gp 5 lb. Periscope, hand 50 gp 2 1b. Rubbing kit 5 gp 1 lb. Spike, iron 1 sp 1 lb. Wand bracer 300 gp 5 lb. The following additional tools can give you a hand in those circumstances when you don't have a proper rogue and Power Attack isn't enough or just won't do. Acid Injector: This simple device resembles a long funnel (generally made of glass or some other acid-resistant material) with a narrow tube at one end and a large storage container at the other. It delivers a powerful acid to burn through the hinges or locks of chests, safes, and other containers, without wasting acid or damaging the contents of these containers. It takes 2 minutes to use an acid injector to apply acid to a surface. When you use it to bypass a lock, hinge, or other vulnerable point on an object's surface, the precise delivery doubles the damage of the acid used. Adamantine Bolt Cutter: This resembles an oversized pair of pruning shears with a serrated inner blade. It is specifically designed to cut through metal bars, bolts, and other obstructions with ease, and allows the wielder to attempt to cut through any bar less than 2 inches in diameter with a hardness less than 20. Adamantine bolt cutters deal 20 points of damage plus 1-1/2 times the wielder's Strength modifier per round. Bolt cutters make poor weapons, serving only as clumsy clubs (-2 on attack rolls). Adamantine Sledge: For the serious basher, this simple sledgehammer is perfectly balanced and crafted from solid adamantine. When you use it to attack a door, wall, container, or other object, it is a 2-handed weapon that deals 1d10 points of damage to the object and ignores any hardness less than 20. Despite its force, however, it is difficult to use as a weapon in combat, and you suffer a -2 penalty on attack rolls with it. Adamantine Toolkit: This kit contains an adamantine file, an adamantine drill (with bits of varying sizes), and a small adamantine hacksaw. It is specifically designed to allow nonprofessionals to bypass locked doors and open locked chests, and the tools are simple and straightforward (if somewhat slow). The drill in this kit allows a character to bore 2 1/2-inch-diameter hole in any object 3 inches thick or less and with a hardness less than 20 with a standard action. This is often sufficient to remove the locking mechanism from a door or container. The hacksaw can saw through up to 1 inch of material with hardness less than 20 with a standard action. Ironbane Acid: This special form of acid affects only iron and other metals weaker than adamantine. One flask of this acid deals 3d10 points of damage to a metal object or creature made entirely of metal (such as an iron golem) and ignores hardness. Ironbane acid has no effect on adamantine or magically reinforced or enchanted metal. You can throw ironbane acid as a grenadelike weapon, in which case it deals full damage to any nonmagical metal armor, weapon, or shield that your target might be wearing or wielding. Woodripper Acid: This special form of acid effects only wood and plant creatures. One flask of this acid deals 3d10 points of acid damage to a wood object or plant creature and ignores hardness. Woodripper acid has no effect on magically reinforced or enchanted wood. You can throw woodripper acid as a grenadelike weapon, in which case it deals full damage to any nonmagical wooden armor, weapon, or shield that your target might be wearing or wielding. Acid injector 75 gp 2 lb. Adamantine bolt cutter 250 gp 2 lb. Adamantine sledge 2,500 gp 15 lb. Adamantine toolkit 750 gp 5 lb. Ironbane acid 30 gp 1/4 lb. Stonebreaker acid 20 gp 1/4 lb. Wood ripper acid 20 gp 1/4 lb.